This fully updated Third Edition of this successful text covers the full spectrum of chiropractic radiology like no other resource. Useful both as a learning tool across the chiropractic curriculum and as a reference and clinical aid to practitioners, the text uses a traditional pattern differential approach to help readers distinguish key pathologic features - invaluable in clinical decision making. 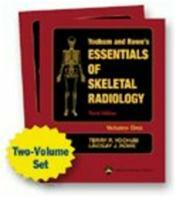 This edition incorporates the latest imaging technologies - including electron beam tomography, ultrasound, and videofluoroscopy- and features more than 5,000 images obtained with state-of-the-art techniques. Coverage includes new chapters on soft-tissue imaging and paraspinal abnormalities and more information on sports-related injuries.